Your insider's guide to a thrill packed day at Holiday World and Splashin' Safari. The Voyage is the winner of Amusement Today's "Top Wooden Coaster" award for five years in a row. Photo courtesy of Holiday World and Splashin' Safari. Wrapped in holiday cheer 365 days a year, Santa Claus is exactly what it sounds like. This seven-mile stretch of town is home to the world's first theme park and three of the world's top wooden roller coasters. Holiday World and Splashin' Safari make this Southern Indiana town a real thrill. Holiday World, formerly known as Santa Claus Land, opened in 1946 as a retirement project by Louis Koch. The father of nine children purchased 260 acres to create a place where children from all over the country could visit Santa all year round. Until 1955, admission was free. 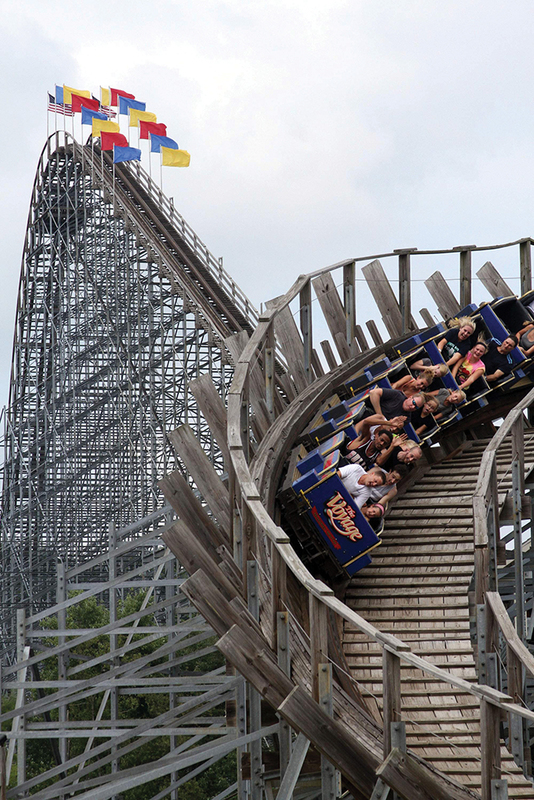 Since Louis Koch's original idea, Holiday World has flourished and grown into a nationally known theme park. As a pair, Holiday World and Splashin' Safari span over 125 acres and are still expanding. In 2006, the park as a whole reached the 1 million mark for seasonal attendance for the first time and ended their 2013 season at 1.1 million. Today, Holiday World provides plenty of thrills and more bang for your buck than competitors like King's Island and Cedar Point. The parks have been named #1 for friendliness and cleanliness by the trade magazine Amusement Today. Admission to Splashin' Safari, named best water park last year by USA Today, is included in your fee. Lather yourself up with free sunscreen and sip unlimited soft drinks to beat the heat. Mariah Nix a 21-year-old from Tell City is an employee of Santa Claus and her family are season pass holders. Many of her childhood memories are from the park. "It's a safe, clean, family-friendly park, but it's also fun for people of all ages," she says. "The staff go above and beyond the call of duty to make sure guests feel perfectly attended to." To help you plan your trip, 812 talked to park staff, roller coaster enthusiasts and regular visitors to bring you an insider's guide to Holiday World and Splashin' Safari. Read on to find out everything you need to know to make your visit a day to remember. 5. Blue raspberry ice cream at Udderly Blue Ice Cream (BEWARE: your tongue will turn "Udderly Blue") great line! 2. Deep fried bacon-wrapped, cheese-filled hotdog on a pretzel bun at Hot Diggity Dogs woah. Twist and Shout from 812 Magazine on Vimeo. If you're looking for that white-knuckle experience, you'll find it on these three wooden coasters and two water coasters. All three wooden roller coasters ranked in the Top 20 of Amusement Today's 2013 Golden Ticket Awards, considered the Oscars of the theme-park industry. "For any park to have three coasters in the Top 20 is nothing but outstanding," says David Lipnicky, public relations director of American Coaster Enthusiasts, a non-profit organization with over 5,000 members from 16 countries who simply love to ride coasters. Named after Edgar Allen Poe's famous poem, this classic coaster is the oldest of the three wooden coasters but still a fan favorite. At 2,800 feet long, The Raven travels through heavily wooded terrain and around Lake Rudolph. Its twists and turns resemble the flight of a raven. Built in 1995 in the Halloween section, this is the first coaster you see as you walk into Holiday World. "The Raven is a classic. I like how as you're walking into the park the first thing you see or hear is the wooden coaster whizzing by you." - Joe Muessig, 24, Loogootee, Ind. You'll also find the The Legend, a spooky ride named after Washington Irving's The Legend of Sleepy Hollow in the Halloween section. After the success of The Raven, Holiday World brought in the same designers to build a longer, faster and higher coaster. It's known for the 113-foot drop at the beginning of the ride and the "four corners of death" near the end. "My grandparents live in the area, and I grew up going all the time when I was younger. I haven't been back in years, but I do remember that I loved The Legend the first time I rode it." -Kyela Specht, 20, Munster, Ind. The Voyage is the newest of the three wooden roller coasters in the park and the winner of Amusement Today's "Top Wooden Coaster" award for five years in a row. Named after the voyage of the pilgrims to America in 1620, the coaster is best known for its record 24.3 seconds of weightless airtime, the most of any wooden coaster. It also has five underground tunnels on a 1.2-mile-long track. "I have had season passes to the park for as long as I can remember. If it's the thrill you're after, you can't beat The Voyage. " -Haley Church, 20, Winslow, Ind. Splashin' Safari is home to the two longest water coasters in the world. Instead of winding down a tube, you are propelled up and down hills by motors to give the ride that coaster feel. Younger kids who don't quite reach the 48-inch mark for the wooden roller coasters can ride these with an adult if they're 42 inches tall. This water coaster has been voted the "#1 Water Park Ride on the Planet" by Amusement Today for four straight years. Bonus: You don't have to clutch an inner tube to your side while you climb hundreds of stairs. This coaster propels you up to the top before you make the four story drop at a 45-degree angle. Holiday World broke its own record for the world's longest water coaster with The Mammoth in 2012. The yellow, red and blue-striped monster takes you up to the top via conveyer belt while you sit in a six-passenger round boat. You can expect seven drops totaling 187 feet. The round boats add the element of surprise --you never know which way you'll face for the next curve or drop. If you're less about the thrill and more about the family fun, try hopping onto one of these rides. 1. Raging Rapids: Get soaked in a trip through an old western town in an eight-person circular boat. Watch out for unexpected sprays of water. 2. Zinga: Get tossed around in a four-person inner tube and shoot out from a closed tube into a colorful funnel. 3. Scarecrow Scrambler: Be thrown from side to side on a ride that will have you walking crooked by the time it's over. 4. Gobbler Getaway: Save the turkeys with your turkey caller on this indoor interactive ride in the Thanksgiving section. 5. Hallow Swings: Pick a colorful seat and strap yourself in with 47 other riders to get the feeling of flying and a relaxing view of the park. When Matt Eckert took over as president of Holiday World and Splashin' Safari last year, he became the first non-family member to run the theme park. However, he had worked closely with former President Will Koch since joining the park staff as a controller on Valentine's Day in 2000. His tenure as president began three years after Koch's sudden death in 2010 and followed a now-resolved family dispute over control of the company. "Matt's knowledge of budgeting and finance coupled with his management and people skills made him an excellent choice for the position," says Paula Werne, the director of communications at Holiday World. 812 took a golf cart tour with Eckert when we visited Holiday World this spring. His enthusiasm about the theme park would be about as hard to miss as Santa's red suit. He even let the phrase "bomb-diggity" slip a couple times while talking about the food and fun. He's proud of how far the park has come and is conscious of the fact that their biggest competition isn't necessarily just other parks. "There are so many things that families can do when choosing how to spend their day," he says. "That is where the competition is, getting them to choose to spend their day here." Safety, he says, is a huge draw. With three kids of his own, Eckert understands the importance of an environment that is truly family friendly. "Safety is our number-one cornerstone. As a parent, I appreciate this, and I want to take my children where I feel they are going to be safe, where I don't have to worry about them being taken or getting hurt." The Holiday World staff likes to add the superlative "est" to their attractions -- "the tallest, the longest, or the fastest"-- but they also like to be innovators in the overall park experience. They took that step in 2000 and 2002 by providing free, unlimited soft drinks and sunscreen. "To this day, even above any of our attractions that we have added, that was probably the smartest move we have made in the history of Holiday World and Splashin' Safari," Eckert says. "It speaks to our commitment to providing a good value for our guests. We really don't want to nickel-and-dime people." Eckert and his team place a heavy significance on training and preparation before and during the season. They are concerned with performance, but Eckert says he feels responsible to do more than just groom his employees. "One of our responsibilities, I have always felt, is not just to provide our employees with a job and a paycheck but to also provide them with some life skills that they can use later on down the road." Holiday World isn't a corporation. Santa may bring in large crowds, but they are focused on affordable family fun. He also takes a lot of pride in the recognition the park gets for its friendliness. "We are very fortunate in the area that we live in," he says. "We have a lot of Southern hospitality. I think a lot of that is just engrained"